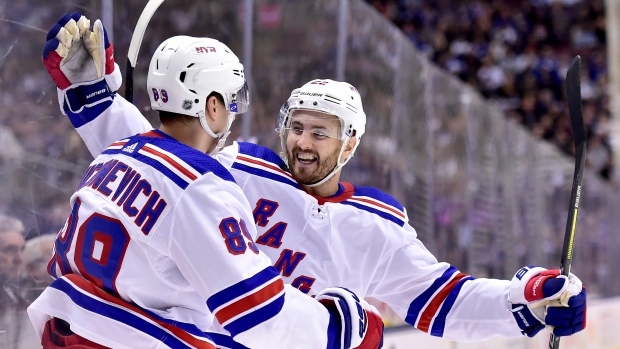 TORONTO – When the final horn sounded to signal the New York Rangers 2-1 overtime triumph against the Maple Leafs, the home team was in familiar territory: on the losing end of a game they could have won, left determinedly looking at the bright side. Toronto did everything but score more than New York, out-pacing them in shots on net 45-28 and controlling possession at 60 per cent. But just like he did in the teams’ last meeting on Feb. 10, a 4-1 Leafs' loss, Rangers’ goaltender Alexandr Georgiev was nearly unbeatable. He made a combined 99 saves in those outings to halt the Leafs’ offensive attack in its track, and stole the extra point again for New York again on Saturday. Only earlier this week, Toronto was in a similar boat, peppering Nashville goaltender Pekka Rinne with 22 shots and dominating possession in a 3-0 loss. The Leafs’ started Saturday's game well enough, amassing a quick 7-1 edge in shots and rolling around New York’s end with ease. The Rangers had posted a lowly 1-6-5 record in 12 games prior to facing Toronto, but were no pushovers either, and the game was still knotted 0-0 through 40 minutes. Not until 19 seconds into the third period was that stalemate broken, off something of a broken play by the Leafs. A rebound went off Frederik Andersen and into a cluster of players in the slot, where Pavel Buchnevich found the puck before Toronto could sweep it out of harm’s way. That made Saturday the seventh straight game in which the Leafs have given up the first goal. Toronto pushed back hard from there, but too many attempts to even the score were just off the mark either high or wide. When Zach Hyman finally got rewarded with an equalizer, he was in good position around the net and sent a terrific feed from John Tavares into the mesh. Georgiev proved impossible to beat again, and Ryan Strome secured the game’s second point one minute, forty-eight seconds into overtime to hand Toronto its fifth loss in seven games. But none among the Leafs were hanging their heads. Toronto also showed continued improvement on the defensive side, limiting its opponent to 30 or fewer shots on net for the third straight game and keeping goals-against at three or fewer per game in that stretch. Considering where the Leafs were a week ago, having allowed 23 goals-against in four games, the strides are promising. The Leafs can only hope that’s the case. With playoffs just over two weeks away, Toronto can't afford to have its usually-potent offence in a rut. But taking these baby steps forward defensively could add up to success down the road, making the current simmering frustrations worthwhile. On a night where there weren’t many great offensive showings by the Leafs, Matthews put together another terrific performance that fell just short of landing him on the scoresheet. In the first period, he was all over Georgiev’s crease, but couldn’t quite find twine on three separate chances in-tight. Matthews did a good job controlling the puck in the second, generating some quality offensive zone time that still yielded no goals, but at least provided spurts of momentum for Toronto. Through two periods, Matthews had three shots on goal but 11 shot attempts, graduating to four shots on net and 16 attempts by the end of the game. And it wasn’t just him that Georgiev was holding at bay; Matthews’ linemates William Nylander and Andreas Johnsson were equally stymied. Together they pulled in 68 per cent possession and put 10 shots on Georgiev with nothing to show for it. As the third period wound down, that line had a series of furious shifts in the offensive zone that had the Rangers on their heels, but New York’s netminder had all the answers. While Matthews has scored fairly consistently of late for the Leafs, with five goals in his last seven games, Nylander has zero goals in 12 games and Johnsson has one goal in 14 outings. For the Leafs prospects offensively to start shifting, they’ll need more contributions from both of them. It’s been a rough couple weeks for Andersen, with only one win to show from his last four starts. For his confidence as much as anything, Andersen needed to get back on track with a solid showing on Saturday, and that’s mostly what he delivered. The much less busy goalie in the game, Andersen still started sharp in the first period, making most of his 11 saves of that frame in the second half when the Rangers took control of the Leafs’ defensive zone. Through the goalless first and second, perhaps the toughest play Andersen had to face never really materialized. In the middle frame, the Rangers had a two-on-none rush that they overplayed and never got a good shot off on. If they had, it would have been a difficult stop for Andersen, but he dodged a bullet as the puck went sliding wide of the net and out of harm’s way. When Buchnevich did eventually score, Andersen originally looked in position to make the stop, but bodies collapsed into his crease area right before the puck sailed by. When Strome potted the game-winner, it was right after Andersen made a great first stop, and then lost sight of Strome with the puck below the goal line before he banked it into the net off Andersen’s own skate. Like there is for the Leafs’ snake-bitten shooters, Andersen has plenty of room to improve before playoffs, at which point he’d like to have recaptured the dominant form exhibited for most of the season. Settling for a point on Saturday will have to suffice as Andersen’s own small step in the right direction. He finished the game with 26 saves and a .929 save percentage. The Leafs’ penalty kill has been one of its strong attributes recently, and Saturday was no exception to that. In the first two periods against New York, Toronto was called for three infractions and its kill only got better tackling each one, keeping pressure off Andersen and generating opportunities the other way. Marner continues to emerge as Toronto’s star penalty killer, balancing the right amount of aggression with smart reads in his own end. In finishing 3-for-3 on Saturday, the Leafs moved to 16-for-17 in their last eight games on the kill. Toronto’s power play hasn’t been quite as successful lately, going 0-for-3 against the Rangers and 0-for-9 in their last three games. The man advantage has been a roller coaster for Toronto all season, toggling between great highs and plummeting lows. This dip hasn’t been marred by major issues, and the Leafs did have some good looks with the extra man on Saturday, but their scoring touch has been more lacking there just as it has everywhere else. With the loss on Saturday, the Leafs move to 6-6 in overtime this season, and remain the only NHL club to not have been involved in a shootout all year.